Today, I do something similar with my teen and twenty-something sons, only I do it electronically. Most of the articles I share come from the reading I do on my Android phone. After reading an article, I find “share” or “email” on the menu, type in the email addresses I want to share with, and push send. 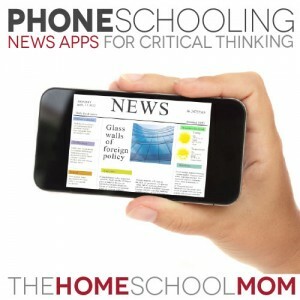 Basically, these apps stimulate our study of current events, and they have become part of our PhoneSchooling. Washington Post – This app includes articles from many sections of the newspaper — top news, national, world, politics, opinions, sports, business, lifestyle, health, entertainment, books, and technology. The Opinion section of the Post is especially thought provoking. The WaPo app also sends me alerts, so I receive breaking news pretty quickly and can forward the most recent news on to my sons. TIME Mobile – TIME’s app also has articles arranged by section. The technology section is one of my favorites in this app. Current articles are about the NSA breaking into the Yahoo and Google data centers, Facebook proposed tracking of users’ cursor movements, a new anti-Cyber attack center in Los Angeles — as well as articles about Sony, Apple, and Twitter. All my sons are interested in tech, and one is a software engineering major at university, and he’s busy with an insider’s view of tech issues. These tech articles give him the macro view that a layperson gets. NPR News – NPR’s app opens to top stories, but also has other sections. The big bonus here is that most of the stories have an audio option, so when I choose a story to email, it is usually one that can be listened to as well as read. As a former reporter for an NPR-member station, I love sharing NPR stories with the guys. They have heard these reporters on the radio in our home and car for many hours growing up, and I know they are familiar voices. BBC News – BBC (British Broadcasting Company) provides an international view to the news. It too has a variety of sections — one of the nice things here is that the app will remember how you customize the sections, so you can pick the ones you want to see regularly. This is handy because it’s the only one of the apps where we closely follow the sports section because of its coverage of English Premier League soccer and other international soccer matches. This gives me plenty of soccer stories to send to my teen soccer player who is still homeschooling — and also helps me keep up. Of course, there are many other publications that have mobile apps, and you can choose which ones to download to your device. Most news apps are available for both iPhone and Android. Sharing news stories often leads to discussions of historical, geographical, political, and sociological context. Long before the word “app” came into general usage, sharing news stories in our household also led to heated kitchen table debates, taking inquiry-based homeschooling all the way to a study of argumentation — including an exploration of the logical fallacies that might be lurking in a brother’s argument. “But how does homeschooling develop critical thinking?” I’m sometimes asked. And this is one way it has happened in our household — the sharing of articles, the discussion, the debate, the analysis of the logic, the weighing of evidence. I try not to overdo the forwarding of stories — I sure don’t want to be seen as a spammer by my own kids. But they frequently comment in response, and most telling of all, they sometimes email me articles they think I’ll be interested in. This is just about enough to cause me to do a fist pump “Yes!” in its own right, but even better was the day shortly after we got smart phones, when one of my young adult sons emailed me from his apartment to be sure I knew there was a BBC app. Basically, that was enough for me to feel like my years of homeschooling have been worthwhile.